Welsh comic writer, Rob Williams kicked off his career writing Cla$$ War for Com.X, with artist Trevor Hairsine, Williams went on to work for 2000AD where he began his collaboration with artist Laurence Campbell, writing Judge Dredd, Low Life and Family for Rebellion. In recent years, he has written DC’s Martian Manhunter, co-created Unfollow for Vertigo and is currently writing Suicide Squad, featuring Harley Quinn, for DC. He also just finished Kingsman: The Red Diamond, a six part series drawn by fellow Portsmouth guest Simon Fraser, published by Image and based on the characters created by Mark Millar and Dave Gibbons. 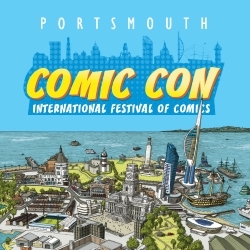 Williams is a comic writer with a very impressive CV and he is a great addition to Portsmouth Comic Con.